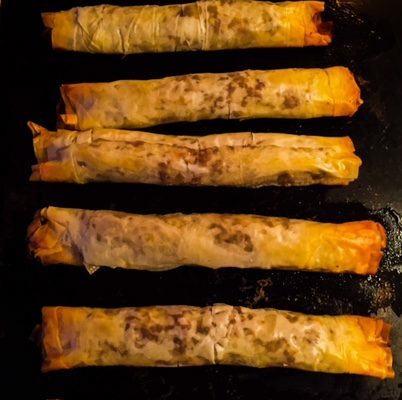 I bought dates that I wasn’t loving from Costco- they are organic, pitted dates but have a dry texture and would be best for cooking, so I wanted to use them up in a dessert and came up with these wonderful crunchy, delicious phyllo cigars. You can use walnuts or pistachios in place of the almonds and fig would also be good in place of or addition to the dates. Just be sure the phyllo is totally defrosted to make it easy to work with and cover with a slightly damp towel when sitting on the counter. Combine the dates, almonds, honey, zest and cinnamon in a processor and combine to make a paste. Transfer to a medium bowl. Heat the oven to 350. Cut the phyllo dough in half crosswise so you have two piles of squares. Lay one square of dough on your work surface and brush with the melted butter, top with another square and brush with more butter. Place about 2 Tb. of the filling on the short end of the dough leaving about a half inch on each side and roll into a cigar shape leaving the ends open. Transfer to a greased baking sheet. Repeat with remaining dough and filling, brushing the tops with melted butter. You should have 8 cigars in total. Bake the cigars until golden about 10 minutes. Cool slightly. Meanwhile whip the cream with the sugar and vanilla in the bowl of an electric mixer until soft peaks form. Serve the whipped cream with the warm cigars garnished with chopped pistachios.